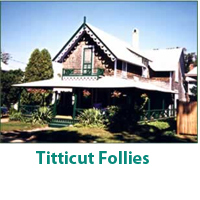 Titticut Follies is part of the Oak Bluffs Victorian seaside resort tradition, this restored 19th century carpenter gothic “gingerbread” cottage houses just 12 guests. Titticut Follies is located one block from the beach and from downtown. There is a wonderful porch for rocking. The accommodations are casual and homey. The town is funny and active but definitely not slick and trendy! There are two rooms with double beds that rent daily and three apartments that are rented by the week in season. (off season the apartments, if available, may be rented for a minimum of two nights) We do not serve breakfast and maid service is not provided. Guests receive fresh linens weekly. There are no phones, TVs or air-conditioning at Titticut Follies. Vineyard breezes and ceiling or window fans provide a more natural method for cooling off. Titticut has wood floors, straw rugs, and vintage furniture. There are paintings by the owner/artist and handmade quilts or chenille bedspreads. Life is uncomplicated and reminiscent of an era long past.